Prepare an acidulated water bath with 4 cups of cold water and the juice of 3 lemons. Using kitchen gloves, peel back about three rows of the outer leaves of each artichoke and cut off cleanly with a sharp knife. Use a peeler to clean the stems, cut the chokes in half and remove the furry choke part in the center. Immediately plunge them into the bath, set aside. In a sauté pan with a tight-fitting lid, sprinkle the oil and half the butter into it. Lay the artichokes cut-side down and sprinkle the garlic, green onions, salt, pepper, wine and stock on top. Cover and place on the stove-top on high; once it starts to cook, lower heat to a slow simmer. Meanwhile, prepare the herbs: Clean the parsley and leaf the mint, then chop finely along with the chives. Mix all together and set aside. After 20 minutes, remove pan from heat and cool slightly. Add the prepared herbs. 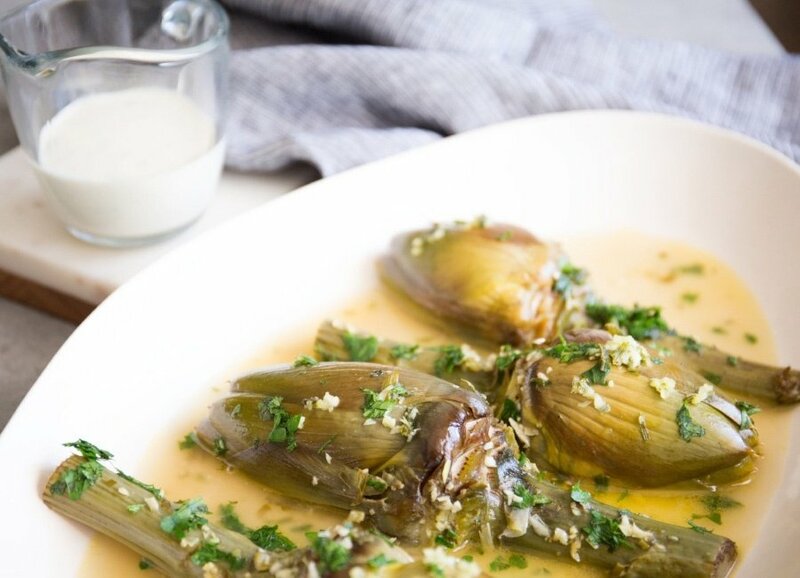 Place the artichokes on a platter, pour the juices mixed with the herbs on top and serve with the aioli dressing. In a bowl, combine the mayonnaise with the minced garlic, chives and lemon juice. Whisk well while adding enough liquid from the artichokes to liquefy the mayonnaise; season to taste.